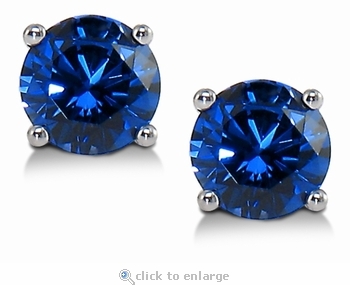 These 1.50 carat each round man made lab created synthetic sapphire stud earrings are set in solid 14k white gold. Ziamond's sapphire look stones are the finest synthetic lab created man made sapphires that are chemically, physically and optically exactly the same as a natural mined sapphire. These laboratory grown round stud earrings measure 7.5mm each in diameter. They are the perfect color of sapphire blue that mother nature intended and are cut and polished to fine gem quality standards. A four prong basket set mounting houses each stone with a standard push back post, allowing a nice low profile and plenty of natural light to reflect through the stones. 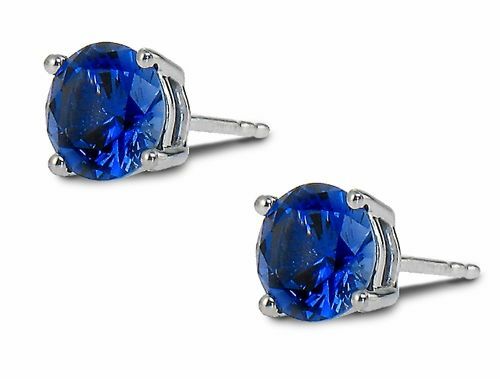 These earrings make a great gift for the sapphire lover as well as a birthstone gift for anyone born in the month of September. Choose from standard backs or large push backs, see menu options. 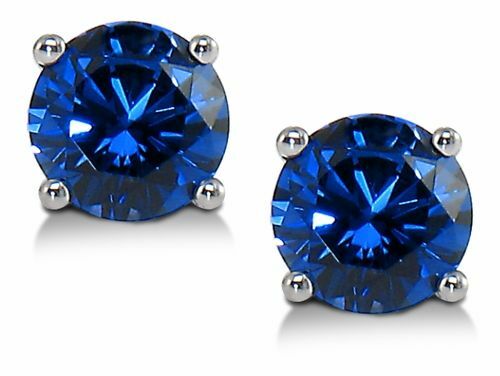 The carat weight on these 1.5 carat each lab created man made sapphire stud earrings equals a total carat weight of 3 carats. For further assistance, please call us directly at 866-942-6663, or visit us via live chat and speak with a knowledgeable representative.